Perhaps even MIT didn’t realize, when they began posting introductory physics lectures online, that the videos would become so popular. Then again, who ever could have predicted the popularity of the Star Wars Kid? Even physics can't explain the phenomenon of internet video popularity, but if it makes more people love physics, I think they'll take it. Professor Lewin is slowly but steadily gaining credibility in the internet realm as a prime source of both info and entertainment. Lewin says he spends 25 hours planning each 45 minute lecture, each of which is packed with fantastic demonstrations and constant reminders of the endless number of everyday places you see physics in action. You can download the lectures for free on iTunes or MIT’s website http://ocw.mit.edu/OcwWeb/Physics/8-03Fall-2004/CourseHome/. When I first heard about MIT putting their physics lectures online I was almost offended. I paid thousands of dollars for a physics education and now it turns I can just get it online?! Of course you can’t get a degree via iTunes (yet…), so it’s not quite the same thing, but I think that moment of selfishness has passed. Having video record of my college courses would have done me loads of good, and might become an important tool for students. I am still a member of the camp that believes it doesn’t matter how you learn it or how long it takes, so long as the desire is there. And, some things are worth learning even if you don’t want to. Simply put, the videos open up the world of science to people in a new way. With the low numbers of physics and math teachers in the US, a champion of physics education is just what the country needs. What’s also nice about this new effort is that it can’t be considered “pop physics”: that sensitive term that could mean bastardization of the field and stunted learning. Rather, it cuts away all of the brush and explains physics concepts in their natural environment; the way physics majors would learn them. Keep in mind that watching a lecture doesn't mean you understand physics, or that you've done everything needed to graduate in the field; but it might spark the start of such a journey for a few people, or just make some new fans. I say huzzah. These videos may also serve to keep you busy with physics for the next week or so while most of us here at Physics Buzz take holiday vacations. I'll be drowning in feet of snow in Utah, so perhaps I'll squeeze in a post about the physics of sledding. Happy and safe holidays! Not the interiors of the Mayan Temples, the secret chambers of the Egyptian Pyramids, nor the inside of massive Volcanoes can hide from…the Muons! They sound like a 50’s horror movie villain, but Muons are nothing to be afraid of. If they were, we’d all be long gone. The Earth is hit with muons at a rate of about 1 per square centimeter per minute, but over time that’s lots of muons colliding with your whole body. These may sound familiar if you read my post a few weeks ago about physicist/detective Luis Alvarez who pioneered the muon method and used it on Egyptian Pyramids. As reported by Science News this week (http://www.sciencenews.org/articles/20071208/bob8.asp), researchers are looking inside the Mayan temples and some massive volcanoes (among other things) using new muon detectors. Most notably, the new detectors don’t need to be underneath the large objects (unlike Alvarez’ original method) but can be put on the perimeter of these large objects, and detect muons coming nearly horizontally through them. Radar and seismic detection methods to see into these objects have failed for various reasons, but Mother Nature has provided a perfect solution. 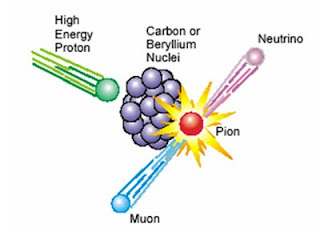 Muons are remnants of cosmic rays of particles from the distant, and not so distant, reaches of space. When these rays hit the Earth’s protective atmosphere, they usually turn into pions, which interact with air and quickly decay into Muons. 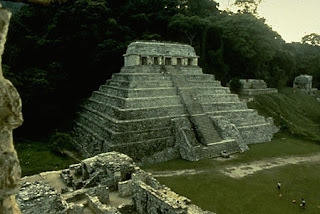 When a stream of muons passes through, say, the Mayan Temple, some of them collide with layers of stone. Therefore, if you measure the number of muons that comes out on the other side, it will be significantly fewer than the number that went in. But if there is a gap in the building, like a room, the muons will pass more easily through there, and more of them will be detected on the other side. This technique can not only reveal otherwise unobtainable information (like structures in the hot depths of volcanoes) or extremely sensitive information (like the delicate interiors of rooms in a Mayan temple). A computer scan compiled over a few months will be able to see, to within a meter, the interior structure of the building or volcano like an X-ray shows your bone structure. Don’t you think it’s about time football fans had more of an interest in physics? Well, maybe you weren’t thinking that specific thought, but you might know that football is a smorgasbord of physics concepts in action. APS feels it’s time they did something about it, and have announced a contest to win the worlds Tiniest Trophy, and $1,000 to boot! The trophy may be, quite literally, the tiniest trophy in the world (We'll see if a Guinness record is on the way…). 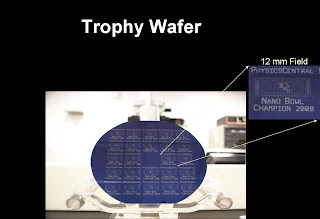 The smallest aspect of the trophy, an image of a football field and helmet, is made up of lines that are only a few nanometers wide. Thats less than a thousandth of a human hair! It’s a wafer, only a few centimeters wide, with multiple images of a football field and helmet. But inside one of those helmets are two, increasingly smaller images. This image (above) shows the trophy. The multiple football fields you can see are each 12 millimeters wide. The etchings are arranged Russian-doll style, with one image inside the next. Inside the helmet of the 12mm (large) engraving, is an identical image of a field and helmet that is 120 microns wide, and inside that is an even smaller one that is only 2.4 microns wide. Above is the mid-sized, 120 micron etching (with better resolution). The lines that make up the third, and smallest, image are only a few nanometers wide. A nanometer is only one-billionth of a meter. These lines are around 1/1000th the width of a human hair! The image is so small that it can’t be seen with even the most powerful optical telescope. You have to use an electron microscope. The engravings are created with atom and photo lithography in which (very basically) beams of atoms or light are used to create the lines. To earn a chance to win the trophy and the prize money, all you have to do is create a YouTube video, around 2 minutes long, that demonstrates physics in football. The video can use any aspect of football, and can be real game footage or your own backyard experiment. To submit a video, upload it to YouTube with the tag “nanobowl.” Let APS know about your video in an email to physicscentral@aps.org. The deadline is January 15, 2008, and the winner will be announced on (duh) Super Bowl Sunday, February 3, 2008. For more info go to www.physicscentral.com/nanobowl, or check out these sites that physics central has listed as starting points for inspiration: Tim Gay's Physics of Football demonstration, hockey, NFL, body slam. I can't change the past because the past has happened; I can’t kill my grandfather because I didn’t. But that in itself doesn't mean I can't travel to the past. The dream of time travel has been shaped and sculpted by movies, science fiction, and our own imaginations; but in those hands it’s only a dream. But to a few capable scientists, time travel is a real possibility in our universe, and one that can be examined with theories of physics. 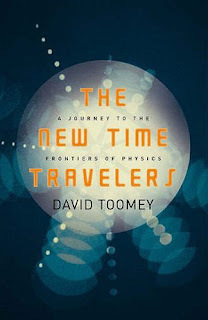 The recently published book The New Time Travelers: A Journey to the Frontiers of Physics, is "a history of the serious study of time travel" by physicists, beginning in 1988. From what the author David Toomey told me about his book, the answers to many of your time travel questions may pleasantly surprise you. David Toomey also happens to be a former professor of mine (a comparable honor). He and I joined a chance to catch up with a blog entry for me. My questions are in italics, and David's responses are in regular print. First, tell me what the book is about. The book is a history of the serious study of time travel that began with a 1988 paper by a group of theoretical physicists at the California Institute of Technology. The authors of that paper (Mike Morris, Kip Thorne and Ulvi Yurtsever) concluded that pastward time travel might well be possible in the universe we know. 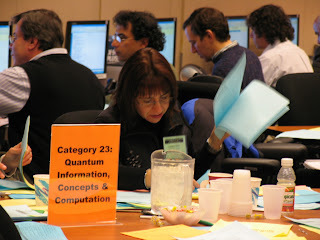 Their work inspired a serious and sustained study of the question and engaged more than thirty physicists working at universities and institutes around the world. Did you write about anything from your own experience? I talk briefly about when I was in Jr. High School and I read H.G. Wells’ The Time Machine. I was intrigued by the conversation in the beginning when the character known as The Time Traveler and his friend discuss the theory of the 4th dimension. I was disappointed that they’d got the theory, and later the machine, but the how is glossed over. Of course, it’s glossed over because Wells didn’t have a how. 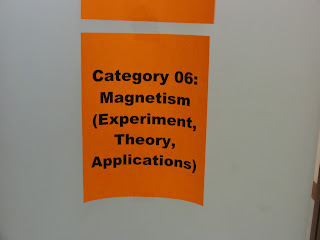 When I found that physicists were exploring the “how”, that was exciting. And it answers the question left unanswered by Wells. Ideas about time travel are viewed by some scientists as far-fetched or not worth investigating. I've also heard that some scientists believe that talking to the general public about theories for time travel are almost misleading because any actual experiments in time travel are very, very far off. What do you think? It is true that the general public can be misled into believing that someone is building a time machine in a university laboratory (or a garage, or a basement or an attic! ); my book makes a point early on of dispelling such notions. The public is interested in time travel, quite naturally, because its problems – the grandfather paradox, the bootstrap paradox and so forth - are 'fun' in the highest, best sense of that word. So while the book admits that no time travel is likely to be in our (near) futures, I hope it also engages in the pleasure of that thinking about it. 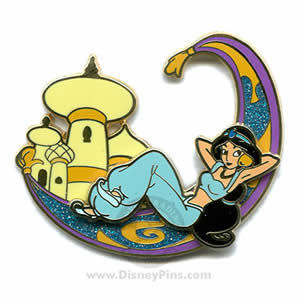 Can you think of something really unexpected that you came across in your search? Yes. There's an idea for something called a "clever spacecraft." Igor Novikov and a physicist named Andrei Lossev were interested in the idea that a time machine could enable us to get something from nothing. For instance, an author might go to the future, find a printed book with her name on it as author, and return with the book to the present, thereby saving herself the trouble of writing it. One question prompted by this scenario is Exactly who wrote the book? The answer is: no one. It was generated, quite literally, from nothing. Novikov and Lossev called artifacts like the book “jinn,” a word meaning a spirit that arises from nothing. Novikov and Lossev claimed that if we presume there is a natural or pre-existing time machine somewhere in the universe (this would be a wormhole time machine of the type imagined by Kip Thorne, Mike Morris, and Ulvi Yurtsever in their 1988 paper), we might take advantage of the situation described above both to find that time machine and to use it. First, we assemble an unmanned spacecraft and a computer that can 1) store its own design and the location of the wormhole time machine, 2) run the design and 3) give instructions for the spacecraft’s construction to an automated plant. If we do all this and simply get out of the way, so say Novikov and Lossev, immediately a very old and battered, unmanned spacecraft lands, whereupon it feeds its own design and the location of the time machine into the computer. The computer downloads this information to the plant, which then constructs a new spacecraft. The spacecraft departs Earth in the direction of the wormhole time machine. When it arrives at the time machine, it enters the "present day" mouth, emerges from the "past" mouth. The past mouth may be 100 years earlier than the “present” mouth, or 1000, or 100,000. It doesn't matter. If the spacecraft can get to Earth before it left, it departs in that direction immediately. If it needs more travel time, it returns to the “present” mouth and travels further pastward before beginning its journey homeward. By using the time machine over and over, it can buy all the travel time it needs. In any case the spacecraft that eventually returns to Earth is the “very old and battered” spacecraft we met before. Novikov and Lossev’s idea is something of a stunner, and it may be one of the areas in this inquiry not much discussed in the other books on the serious study of time travel. Matt Visser is a physicist at Victoria University of Wellington, New Zealand. He has done quite a bit of work on time machines, and he told me that at a 1992 workshop in Aspen the idea was discussed, and the whole thing was taken kind of lightheartedly. At the same time he also said that if pastward time travel is possible, in the view of many, it has to be self-consistent. Self-consistent pastward time travel is the kind you see in a lot of Hollywood movies. To take an oft-cited example, if I travel to the past and try to kill my grandfather, something will prohibit me. It might be a slip on the wet floor, a change of mind, or a particle in the barrel of the gun; but it will be something. I can't change the past because the past has happened; I can’t kill my grandfather because I didn’t. But that in itself doesn't mean I can't travel to the past. It only means that if I travel to the past I will have always traveled to the past. Wow. I’m kind of trying to wrap my head around that. What questions does your book leave open or unanswered? That would be telling, wouldn't it? Just kidding. The book leaves open the big question - that is, "Is pastward time travel possible?” It leaves the question open because, so far as most of the researchers are concerned, it *is* open, and it will remain open until we have a theory of quantum gravity. I've also heard that there are a lot of "crazy" ideas out there about time travel physics. In a subject like time travel, how do you distinguish between a "crazy" theory and a "legitimate" one? Do you know of anyone else who has made a collection of these ideas? Not on this subject. There are other books on science that have done things like this, and almost all of those I think were written by physicists who had done work in it. What inspired you to write a book like this? And how did you get the idea to go about it in this way? I think that everyone is interested in time travel. That's why it's so widely treated in fiction and film. You don't have a scientific background: what challenges did you face writing the book? What advantages did it give you? The challenges were, simply, an initial unfamiliarity with what journals count as important, with some specialized vocabulary, and so forth. I'm not sure my non-scientist status gave me any advantage at all, except that I could better anticipate places where my readers would be confused and need help. After talking to so many of them, do you think physicists are weird? Ha! I'm not sure I have enough of a data set to draw that conclusion. Seriously, the several I talked with at length seemed no weirder than academics in any field. But I will say that I now know that their chosen subjects – especially astrophysics and cosmology - can bring out weirdness in others. Since the book's publication, I've had my share of emails from well-meaning people who want to share their theories of ... well, everything. David Toomey is a professor of English at the University of Massachusetts, Amherst where he teaches writing and technical writing courses. He holds a Ph.D. in English Literature from the University of Virginia (1998). He is the author of Stormchasers: the Hurricane Hunters and their Flight into Hurricane Janet; co-author of Amelia Earhart's Daughters: the Wild and Glorious Story of American Women Aviators from World War II to the Dawn of the Space Age; and second author of Scientific and Technical communication in Theory, Practice and Policy. The APS March and April meetings offer every APS member the chance to give a 15 minute talk about, well, just about anything they want. Ok, it’s usually on research, but can also be essays on the history of science, science and society, science education, or a number of other sub groups. You do have to submit an abstract describing your talk, and over 6,000 abstracts have been submitted this year! Do the math...a 5 day conference, with 8 hours a day, with 6,000 abstracts...thats 1200 talks a day, and over 150 talks per hour! Assuming 15 minutes per abstract, that means about 40 separate sessions have to be going on simultaneously all day long. To organize the jumble of electronically submitted abstracts, physicists from all over the country fly or drive into College Park, Maryland for a day of free food and physics talk. It’s fun for employees of APS because there are people running through the building all day. Here’s some pic’s from the front lines. 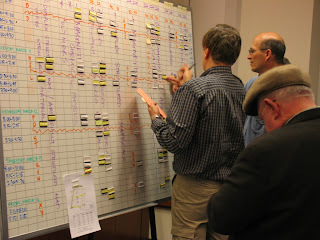 I asked Dr. Ted Einstein from the University of Maryland why he keeps coming back as a volunteer sorter. He answered, "We like to see the sessions well organized at the meetings. It's sort of a civic duty." It's not a great effort for Dr. Einstein to make it to the APS building (he's less than 2 miles away), but some volunteers come thousands of miles. I told Dr. Einstein, "I saw your name and thought you'd be the one to talk to. Do you get that a lot?" He replied, "No, this is the first time that's happened." 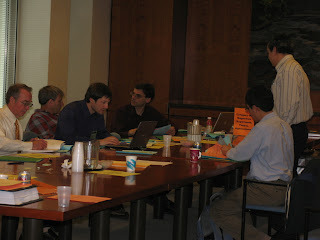 To keep the abstracts organized, volunteer sorters try to break them into smaller groups, to make up sessions on particular topics. 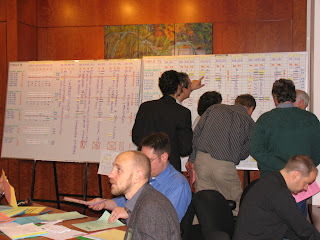 They have to figure out where to place every single abstract (see the big board in the top picture). 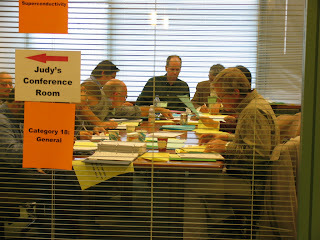 Plus, the sorters try to judge which abstracts might be particularly important or groundbreaking, so they can put those in popular sessions. Because of how many abstracts there are, the sessions can get VERY specific, like Neutrino Detection in the Antarctic, or Electron Structure in Reduced Dimensions. To cushion the blow, APS divides the meetings up in to March (the larger of the two, by far) and the smaller April meeting which is for particle, nuclear and astrophysicists. The April meeting gets around 1,200 abstract submissions. The APS March meeting will be held in New Orleans this year, and the April meeting will be in St. Louis. The news today reinforces that the battle to have intelligent design taught in science classes, rather than evolution, is going strong. Strong like a big, angry, drunk rhinoceros in a shopping mall. Comer "resigned" over a memo that suggested she might have an opinion about intelligent design (particularly that it should not be taught in science curriculum). Here’s the run-down: the Texas Education Agency is claiming that it is supposed to be UNBIASED or HAVE NO OPINION EITHER WAY about the issues of intelligent-design and evolution. (Give yourself a pat on the back if this already sounds not quite right) So, when word got out that their head science advisor actually had an opinion on the matter, she was suddenly in a position to resign early. I have to wonder what the hell a Science Curriculum Advisor is doing all day if not having an opinion about what science (or non-science) is being taught in schools? There’s plenty I could write on this topic, but it’s almost too much. More than discussing the issue of intelligent design, I choose to focus on the idea that intelligent design and evolution are two ends of the same spectrum. Lets get one thing clear: Just because you are in the middle of two extremes does not mean you are unbiased, nor does it mean you are in the middle of the road. Angry. Clearly angry. Can you imagine the uproar if the government insisted that there be a chemistry lesson on the likelihood of bread transforming into flesh before every Catholic sacrament? I'd be angry because I believe in freedom of religion. It's time we enforced freedom of science. You have the choice to believe it or not, but you cannot be persecuted for doing so, and science classrooms are included. It's true that (for the most part) if you believe in Evolution, you don't believe in intelligent design. And vice versa. So for a lot of people that causes a problem. Most Christian denominations have their own methods for determining what truth is, including various ways to interpret the Bible. If something doesn’t fit with that method of determining truth, that something is not included in the doctrine of that religion. Similarly, whether or not you believe in it, science has its own method for determining what truth is. To say that one doesn’t believe in current theories of evolution may, in fact, have some scientific ground. But teaching intelligent design should not be thrown in with science because it does not fit with the method that science has for determining truth. If you don’t agree with the scientific method, don’t hire a science advisor. Just be honest, Texas: you never intended to teach science and you never will. Just because crackpot in a cabin in Vermont thinks we can defeat global warming by throwing Skittles at it, doesn’t mean I’m middle of the road if I take his/her idea into account with fuel cells. I would never stop him/her from believing it, but I won’t teach it to my kids. “When a member of a science department declares they are both a scientist and a believer in intelligent design (AKA Creationism) that strikes us an intellectual conflict, not one of science and religious beliefs. I can be an evolutionary biologist and believe in God as creator of natural laws or the process of evolution. I cannot be an evolutionary biologist and believe in creationism. Very well said. Then again, how can someone not be influenced by what they believe or where they come from? The idea of being an "unbiased" human being is contradictory and nearly impossible. Which is why we need to set up distinct dividing lines (i.e. separation of church and state) and abide by them.